Take two! 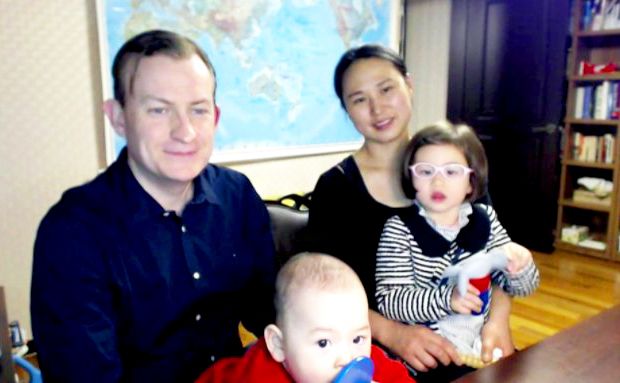 Professor Robert E Kelly, who went viral last week when his kids crashed a live televised BBC News interview he was doing via Skype, spoke with the news outlet again Tuesday, March 14. The time, his wife, Jung-a Kim, and their children, Marion and James, joined in on purpose. When he originally appeared on BBC News Friday, March 10, to discuss the impeachment of South Korea’s Park Geun-hye, his daughter opened the door and bounced in wearing yellow goggles. While Kelly, a professor in the Department of Political Science and Diplomacy at South Korea’s Pusan National University, tried to nudge her off screen, his son bopped in on a rocker to join the fun. His wife then attempted to do damage control and rushed in to shuttle the children out of the home office. The anchor played it cool, though, and Kelly only acknowledged the moment with a simple “Pardon me” at the time. Kelly even settled one of the Internet’s biggest questions about the viral video during his chat with the BBC News’ James Menendez Tuesday: He was, in fact, wearing pants during the original interview.